Sri Sankara, the Adi Sankara-charya is one of the greatest thinkers of all times. This country owes him a deep debt of gratitude. He not only consolidated the classical values of life but also reorganized what we now call Hinduism. He brought together diverse strands of philosophical speculations and religious disciplines. Unfortunately, few philosophers in the world are as misunderstood and misinterpreted as Sri Sankara. Ironically, most of the harm came from his admirers and followers. 1. It became a trend in the middle ages among the lesser authors to float their work in the name of celebrated authors to ensure its acceptance by the scholars of the day. Following this custom, many of Sri Sankara’s admirers hoisted their works on him .In some other cases, brilliant works were submitted by their authors in his name. This was an act of devotion. As a result, we have today, more than 250 works ascribed to Sankara. These include philosophical treatise (bhashyas), advices to aspirants (updaesha), minor dissertations (prakaranas), hymns addressed to various divinities, poems etc. The quality of these works is not consistent. Some of them undoubtedly have merit. It is however, obvious not all of them could be works of one author. The ideas expressed in them are not only various but often inconsistent. In a few cases, the works contradict each other. ( E.g. Two commentaries on Kena Upanishad, both ascribed to Sankara have conflicting views) .The ideas contained in a few others came into existence much after Sankara’s time. 2. Sri Sankara during his lifetime decried and fought against Tantric practices. However, Tantric texts like Prapancha_sara, Lalitha_trisati_bashya and others are in circulation under his name. The other famous tantric work ascribed to Sri Sankara is Sandarya_lahari. The scholarly opinion is that it is not Sankara’s work, though it is an excellent composition. 3. Among the minor dissertations (prakaranas): Sarva-vedanta-siddanta-sara_sangraha; probodha-sudhakara; Advaitanu-bhuti; Yoga-rathavali; Anatma-vigrahana– prakarana etc.are definitely are not Sankara’s works. 4. A commentary on Vishnu_sahasra_nama is ascribed to him. It is decidedly a recent work. It is inconsistent too. It is not Sri Sankara’s commentary. 6. One of Sri Sankara’s missions was to wean people away from ritualistic approach advocated by Mimamsakas and to project wisdom (jnana) as the means of liberation in the light of Upanishad teachings. He criticized severely the ritualistic attitude and those who advocated such practices. However, the texts that combined rituals with wisdom (jnana_karma_samucchaya) more in favor of the Mimamsaka position came onto vogue, projecting Sankara as the rallying force of the doctrine. His followers might have found Sankara’s mission a hard task and therefore compromised the liberating wisdom with the performance of rituals. 7. Whatever be the popular opinion, the scholarly tradition recognizes only three texts as authentic works of Sankara. These are his commentaries on the Upanishads, the Gita and on Vedanta Sutras; grouped under the name prasthana_thraya. 1. A word about Vedanta Sutra before we proceed: Vedanta Sutras also called Brahma Sutras deal with the essential import of Upanishads. They are rendered in the form of Sutra (aphorism), terse and crisp. They are therefore open to interpretations. The work is ascribed to Badarayana, who is often identified with Krisha_dvaipayana_vyasa; the author of Mahabhatarha. Sri Sankara is however is silent on this issue. 2. Sri Sankara’s commentary on this Sutra, called the Vedanta Sutra Bhashya (VSB) is a highly celebrated text. Sankara’s purpose in writing his commentary was to explain the traditional view. He said, the primary meaning of the word Upanishad was knowledge, while the secondary meaning was the text itself. He isolated the Upanishad lore from the rest of the Vedic body and narrowed it down to ten or twelve Upanishads. Even here, he did not include the ritualistic portion of the Vedas. This was in contrast to the classification followed by the later Acharyas. 3. We may assume that there were other points of view in circulation in those days and they did not entirely represent the traditional view. (No commentary on the Vedanta-sutras survives from the period before Sankara. )This motivated Sankara to come up with his precious commentary. Sankara explained that wisdom (jnana), according to the real import of Upanishads, was the true means of liberation. Sankara’s interpretation of the Upanishads marked the beginning of a new line of thought. The then existing Vedanta terms (like Brahman, maya, avidya, adhyasa, jnana, mukthi etc.) acquired in his work a deeper significance, wider context and a greater relevance. [ Sri Sankara seems to take Brahma sutra more as an exposition of the Upanishads than as an original text. For him, therefore, the Brahma sutras derive their authority from the Upanishads; and, the sutras must therefore conform to the meaning and the spirit of the Upanishads. The Brahma sutras will have to be interpreted in the light of the Upanishads. Sri Sankara undertakes to interpret Badarayana’s Brahma Sutra in order to expound through what he understood as the philosophy of Upanishads taken as a harmonious and systematic whole. The fact that he had written commentaries on the principal Upanishads, presumably, before his commentaries on Brahma sutra and the Bhagavad-Gita goes to show that he had grasped the keynote and the essence of the Upanishads. These became central in his interpretation of Brahma sutra as also of Vedanta philosophy. Sri Ramanuja in turn interprets the Brahma sutra through the Vrtti of Bodhayana and the glosses on the Vrtti by the other purva-acharyas, the old-masters. 1. The history of Advaita is replete with interpretation and reinterpretation of Sankara’s Vedanta Sutra Bhashya (VSB). The generation of Advaita followers that succeeded Sankara wrote a number of commentaries on Sankara’s VSB. Each commentator claimed that he grasped the essence and true intent of Sankara and went on to write according to his own understanding. In that process, he wove into the commentaries, his personal views and hoisted them on Sankara. This kind of adulation gave rise to several versions of Advaita. The numerous glosses written by his followers tried to blend ritualistic attitude with the monistic inclination of the Master. The result was the distortion of Sankara’s position. 1.1. The so-called orthodox interpretation of Sankara flows in two distinct channels; the one based on Bhamathi and the other on Pancha_padica. 2. Vachaspathi Misra (c.840AD) was a well-known scholar and a commentator of his times. He wrote a number of glosses and commentaries on several schools of thought. His commentary on Sankara’s VSB was titled Bhamathi. 2.1. Bhamathi revels in dialectic and relies on Mimamsa (ritualistic approach) which Sankara did not approve. Further, Vachaspathi brought together, in Bhamathi, the views of Sankara with the ritualistic views of Mandana (a Vedanta scholar, author of Brahma siddhi); whose views were severely criticized by Sureshvara, a direct disciple of Sankara. Though Sri Sankara and Mandana belonged to the same Vedanta branch they differed on ritualistic aspects of Vedas. Yet, while interpreting Sankara, Vachaspathi introduced ideas borrowed from Mandana and hoisted them on Sankara. Many ideas that appear as Sri Sankara’s in Bhamathi were in fact not his. [ Mandana Misra is a seminal figure in the history of Advaita He was a contemporary of Sri Sankara and the Great Mimamsaka Gaudapada. His work Brahma-siddhi and Gaudapada’s Karika on Mundaka Upanishad are in fact only two surviving works of the pre Sankara period that have come down to us. Mandana’s citations from or comments and remarks on previous other authors, either refuting or endorsing their opinions, make him one of the credible resources on the state of Advaita prior to the time of Sri Sankara. His comments on some of the disputed concepts of Vedanta such as : Vivarta ( unreal appearance) , Anirvachaniyatva ( inexplicable state) or Maya-vada ( doctrine of the seemingly real or unreal) have always attracted the later scholars and students of Vedanta .He is perhaps the first to attempt to establish the Advaita doctrine through means of cognition Pratyaksha , direct perception. He argued that Pratyakshya cannot prove the reality or otherwise of an object because the direct perception is incapable of truly appending the distinction between the Real and the unreal (or seemingly real). Though Mandana may have been influenced by Sri Sankara’s Advaita Vedanta, he did retain some of his own position on certain matters. Certain features of his doctrine are, in fact, not found among the principles laid out by Sri Sankara. Just to mention a few of his own elaborations the following could be cited: the inexplicable nature of Avidya (ignorance); making out a distinction between two sorts of Avidya; importance he placed on Sat (Being) and Bliss (Ananda) as the more significant attributes of Brahma etc. Interestingly, Vachaspathi Misra, in his commentary (titled Bhamathi) on Sri Sankara’s Brahma-Sutra-Bhashya tended to follow, on certain issues and explanations, the lead of Mandana Misra rather than that of Sri Sankara. Vachaspathi Misra’s commentary (Bhamathi) juxtaposed with another commentary of Padmapada (one of the direct disciples of Sri Sankara) on the Brahma Sutras caused a major split or schism in the Advaita School. From then on, two rival streams of Advaita School – one called the Bhamathi School based on Vachaspathi Misra’s interpretation of , and the other Vivarana School based on the explanations provided Padmapada in his Pancha-padika-vivarana, came into being. 2.2. Regardless of this position, a branch of Advaita literature grew thereafter with Bhamathi as the official version of Sankara’s view. Further, Bhaskara’s views were fused or confused with Sankara’s views. The interpretations and arguments of that branch were lined up accordingly. Akandanandaa’s Rju-prakasika, Anandagiri’s Saririka_nyaya_nirnaya and Govindananda’s Bashya_rathna_prabha were some of the texts produced in this school. These texts do not reflect original Sankara. 2.3. Today, the study of Sri Sankara, in orthodox circles, is based, mostly, on the Bhamathi and the annotations on it by Amalananda (Vedanta_kalpataru c.1250) together with notes of Shri Appaiah Ditkshita (c.1550). These three together with Vedanta Sutra and Sri Sankara’s commentary on it constitute the basic Advaita literature (pancha granthi). This is despite the fact the views of Sri Sankara and Vachaspathi are divergent on issues relating to rituals and scriptural authority. The most celebrated work in this school was, undoubtedly, the Pancha_dashi written by Vidyaranya, who also abridged the Vivarana (Vivarana prameya sangraha). 3.2. The texts such as Pancha_padica, Advaita_siddhi and Pancha_dasi are brilliant works and have great merit. They are landmarks in the development of Indian thought. However, they do not correctly represent Sankara’s thought; they cloud the original Sankara. The question is, no matter how brilliant the ideas, imagery and arguments introduced by the later scholars be, were the authors justified in hoisting their views on Sankara? 4. If the body of Advaita literature were to be taken together, Sankara would be contradicting himself. He would at once be a nihilist, a ritualist, an obscurantist and an idealist too. It is difficult to cull out the original Sankara from the mass of accretion that collected over the centuries. The best introduction to Sankara’s thought is his prelude to the VSB viz. the Adhyasa_Bashya. 5.1. Mimasakas held the view that the real purport of the scriptures was to provide injunctions and prohibitions. The scriptural injunctions were mandatory and the texts that relate to wisdom were spillover (sesha). The real purpose of the scriptures, Sankara said, was to describe the reality as it is. Sankara rejected the Mimamsa view and argued that scripture were not mandatory in character, at least where it concerned pursuit of wisdom. Upanishads, he remarked, dealt with Brahman and that Brahman could not be a subject matter of injunction and prohibitions. He also said study of Upanishad was neither indispensable nor a necessary pre requisite for attaining the human goal, the moksha. He pointed out; even those who were outside the Upanishad fold were as eligible to moksha as those within the fold were. He declared that all beings are Brahman, and therefore the question of discrimination did not arise. All that one was required to do was to get rid of Avidya (duality). He pointed out that rituals could in no way bring about wisdom, much less moksha.. He asserted, while the rewards of the rituals were not matter of direct experience, wisdom which is the fruit of Vedanta is based on immediate and personal experience; one need not have to wait for the reward nor one be in doubt whether the reward would or would not come. This was in sharp contrast to the position taken by Mimamsakas who asserted that rituals alone would lead one to higher levels of attainment. Further, the deities would reward only those entitled to perform the rituals alone. The entitlement involved the caste, creed and other parameters. 6. Most of the ideas that Sri Sankara rejected came back to the Advaita fold and the Mimamsa position with regard to the scriptural authority and value of rituals became a part of the Advaita posture. The wisdom –oriented teachings of Sankara became as much a face of Advaita as the rituals, worships and other practices. There was therefore an obvious disparity between what Sankara idealized and what his followers, even the elite, practiced. 7. By about tenth century, the Advaita scene was littered with a confusing array of texts that did not outline a well-defined doctrine. The rise of the sects and sectarian prejudices did not also help matters.8. The “rival” Vedanta doctrines when they came on stage, naturally, reacted to the Advaita texts in circulation at the time. It was that form of Advaita, which they encountered, that gave cause for dissatisfaction and annoyance. While criticizing Sankara they relied on the later exponents than on Sri Sankara’s own views. The result was the distortion of Sri Sankara’s position. He was criticized for what was hoisted on him than on what he said. For instance, by the time Sri Ramanuja (1017-1132) emerged as an exponent of orthodox Vedanta tradition, Ishta_siddhi written by Vimuktananda was the standard advaita text of the day.Ramanuja’s criticism of Sankara was based mainly on this work. Interestingly, Madhva (1197-1276) another Acharya also criticized Sankara based on the views presented in Ishta_siddi. It is said that Sri Madhva pointed more than thirty errors of argument in that text. 9. The “rival” schools of Vedanta thoughts like Vishistadvaita and Dvaita took Advaita as the common point of departure.By then the Advaita schools were in a confused state and reacted with emotion; though much of the conflict that ensued was academic. It is fair to say, the new trends emerged in fulfillment of the needs of the time. 1.1. The popular belief is that Sankara “found” Advaita system of Vedanta, promoted and popularized it. This is a misconception. 1.2. Sri Sankara clearly said he was not putting forth a new theory or a school of thought. He did not expound or defend any argument (vaada) either in his VSB or in his commentaries on Upanishads and Gita. His mission was to present the true interpretation of the Vedanta tradition. His school of thought (asmadeye darshane), according to him, was the Upanishad system (aupanishadam darshanam) or the doctrine of emancipation (moksha vada). Sankara was the upholder of tradition (Evam sampradaya vido vadanti). 1.3. Sankara did not claim he found Advaita school of thought or that he was an Advaitin. He used the expression “Advaita” in VSB only two times and on both occasions, he was quoting: once from Gaudapada’s karika and the other time from Brihadaranyaka Upanishad. Gaudapada in his karika employed the term as a descriptive expression for Brahman (or Atman).Sri Sankara followed the lead of his guru_naam_guruhu (teacher’s teacher). 1.4. At that stage,” Advaita” was yet to emerge as a Vedanta doctrine and as a separate school of thought.. The term “Advaita” does not appear in Bhamathi , written about a hundred years after Sankara .Bhamathi calls Sankara’s exposition as investigation into Brahman(Brahma mimamsa), a logical procedure(tarka) and treats it as such. 1.5. The Advaita argument (Advaita_avada), as a school of thought was a post Sri Sankara development; though the essence of the doctrine was in his VSB and in Adhyasa Bhashya. 2.2. The logical elucidation of “oneness” of Atman in Sri Sankara’s VSB appealed to his followers. They turned that in to a school of thought (Advaita_vaada) in order to distinguish it from the dualistic thought (Dvaita) that emerged after Sri Sankara. 2.3. A school of dualistic thought was not in existence at the time of Sankara. The question of his attacking them did not therefore arise. The only dualists he mentioned were Samkhya and Yoga systems. 3.1. Among the misconceptions that have grown around Sri Sankara, the persistent and the most erroneous one is that he regarded world as an illusion. It is a gross misrepresentation of Sri Sankara. 3.2. The concept of phenomenal projection Adhyasa, which is basic to Sri Sankara’s thought is seriously misunderstood. The acceptance of twofold perspective, transcendental (absolute) and transactional (relative) is at the root of his Adhyasa concept. 3.3. Sri Sankara neither takes the world we experience as absolutely real nor does he denies its reality altogether. He brings in the concept of the Absolute and the relative view of things. Failure to understand the concept of Adhyasa resulted in such confusion. 4.1. Sankara did not drive Buddhism out of India. He came nearly 1200 years after the Buddha. By Sankara’s time (c. eighth century), Buddhism had lost its vigor a couple of centuries earlier and had moved into the neighboring countries. 4.2. Sri Sankara’s dispute with the Buddhist schools (Madhyamika and Vaibashika) was purely metaphysical and not religious. By this time, Buddhism (Mahayana) had moved closer to Upanishads and the chasm between Vedanta and Buddhism had narrowed a great deal. 4.3. Gaudapada who was the teacher of Sankara’s teacher, and whom Sri Sankara addressed as the “knower of the tradition” (sampradaya vit) employed terms that were commonly in use by Mahayana Buddhism and the orthodox Schools. Gaudapada was not a Buddhist, he was a vedantin. Shri T.M.P.Mahadevan an authority on Gaudapada confirmas this position; and, says Sankara was wrongly handed down the epithet of “Buddhist in disguise’. In the article on Sri Sankara, you state, “.. in Bhamathi, the views of Sankara with the ritualistic views of Mandana (a Vedanta scholar, author of Brahma siddhi); whose views were severely criticized by Sureshvara, a direct disciple of Sankara.” Popular biographies of Sankara suggest that Mandana Mishra, husband of Ubhaya Bharati who was a great Mimamsin, lost to Sankara in the famous debate and became Sureshvaraachaarya. Is the Mandana mentioned in your article different from Mandana Mishra? I am enjoying reading your articles, which are very scholarly and well written. Thank you for publishing them for everyone to read. Thanks for the visit; and for the appreciation. Yes; the identity of Mandana Misra is much debated. As you said; Sureshvara is one of the most well known disciples of Sri Sankara. He is variously identified with as many as four personalities: Sureshvara; Mandana (Misra) ; Visvarupa; and , Umveka ( Umbeka). Some western scholars (e.g. GA Jacob) identify Sureshvara with Mandana Misra who, before meeting Sri Sankara , was said to have been a disciple of Kaumarila Bhatta ; and , therefore a Mimamsaka. Other scholars , notably Indian , have tried to tackle the issue by classifying into (i) Mandana Misra , the disciple of Kaumarila Bhatta , defeated in a debate with Sri Sankara ; and , who later became a disciple of Sri Sankara; and, (ii) Sureshvara aka Visvarupa , a disciple , of Sri Sankara who is said to have attempted a sub-commentary on “Sankara –Bhashya’. Most scholars, however, prefer to treat the two – Mandana Misra and Sureshvara – as being separate individuals; though both were disciples of Sri Sankara. In addition it is said; Sureshvara and his pupil Sarvagnatma Muni were Advaitins of Pre-Sankara period. He is said to have held a slightly different view on the question of ‘Maya’ and on ‘jnana-karma-samucchaya’ – the fusion of jnana and karma. His views also differ from that of Mandana and Vachaspathi Misra. The works ascribed to him, among others, are: Naishkarmyasiddhi and Brihadaranyaka-upanishad-vrittika. Mandana Misra (because of his Mimamsaka background) is credited with more works on Mimamasa and Grammar, than on Advaita. The work ‘Brahma-Siddhi’ ascribed to Mandana, in fact, talks about a slightly different brand of Advaita. Vachaspathi Misra in his Bhamathi (a commentary on Sri Sankara’s Brahma-sutra-bhashya) followed Mandana’s interpretation of Maya, Avidya etc rather than of Sri Sankara. This brand of Advaita came to be known as ‘Bhamathi-prasthana’. And, for very long time thereafter, it is said, it was Mandana who was viewed by other schools as the major figure in Advaita. Please do read the other articles in the series. i was trying to focus on the historical sankara , the bashyakara. the first part was of course how he has been misrepresented by his followers and admirers. but more importantly , i tried to explain his concept of adhyasa/avidya and his view of the world – relative and absolute, his regards for an individual’s experience and his anxiety to stress the importence of vidya and futility of rituals. these i thought were wonderful concepts and they are everlasting. but as melody queen suggested i think i should take this away from the present blog and post it separately, for two reasons_ the blog as it is ,is engthy and the adhyasa bashya part should getfull attention and not clubbed with te rest . i agree with her, entirely. i have not read the book you mentioned , by sri chandra shekaraiah , what does it say about universe or of sankara’s views of it?please let me know. in fact , i wrote an article about the theory of creation as per the texts. but i was not sure of certain aspects of it . i therefore held it back. let me see if it helps me. i will go back to your blogs after this exercise. some references were made to terms like pantheism, nothingness, advaita, nihilism. this is, as i understand the terms. i may be wrong. please take a look. “phenomenalism” argues that everything is a phenomenon, including reality itself and the individual. “pantheism” argues that all is nature. for pantheism there is no transcendent being, everything is immanent in an absolute sense and the divine itself becomes the world. this advaita states brahman is indeed none other than the universe. brahman does not become the world. the distinction is about being and becoming. becoming is a process where one transforms into another. one merges with the other to unite. this refers to pantheism. there is duality. advaita vedanta is one of being. brahman is not a deity to be worshipped. viewing the absolute reality as godhead is not the issue here.. brahman is universe. no duality. nihilism is an english word that conveys the meaning of (a) an extreme form of skepticism that denies all existence; (b) a doctrine that says all values are baseless and that nothing can be known or communicated. nihilism is often wrongly used as an alternative word for sunyata. sunyata (emptiness), is a broader application of the buddhist statement of anatta, saying that neither the observer nor the observed – neither the object nor the knower of the object have any real ground — any objective basis in reality. sunyavada signifies that everything that one encounters in lfe is empty of absolute identity, permanence or “self”.this is because everything is interrelated or dependent. all things are in a state of flux undergoing transformation. nagarjunas philosophy is madhyamika,which claims to tread the middle path not because it claims to bring together two opposing views of the sarvasthivada (“doctrine that all is real”) and that ofyogachara ( ” the mind only”) school; but by rejecting both the schools. nagarjuna used the dialectic methds to ruthlessly negate all pairs of opposites. sarvasthivadins followe the realist line , stating that all phenomina exist and are unstable components of elements. the basic approach of the sarvasthivada was to regard the universe as reduciable to various elements or coeficents of existence. according to yogacara school , all elements are derived from the mind. it says that consciousness (vijnana) is real, but its objects are unreal. the school is therefore nicknamed “mind-only” school as it emphasized subjective idealism – that consciousness is the ultimate reality. the yogacara school emphasized that the ultimate truth can only be known through meditation. the study of scriptures or dharmas is only in the realm of relative truth and is subject to change and constant improvement. scriptures were compared to a finger pointing at the moon. as the finger, itself has no brightness, it said, so the scriptures have no holiness. nagarjuna rejected both the schools. he said there was neither reality nor non-reality but only relativity. madhyamika introduced the concept of sunyata or emptiness. it taught that all elements (dharmas) are empty of “self nature” or “essence” (svabhava), are impermanent, and have no existence of their own. they may be broken down into parts, the parts into sub-parts and so on infinitely. therefore, nagarjuna said, all phenomena have a relative as opposed to an absolute existence. all life is reduced to a single, underlying flux, a stream of existence with an everlasting becoming. gaudapada the teacher of sankara’s teacher (parama guru), it is said, was closer to this line of thought. he, however, took an extreme view and tried to prove that walking objects were as unreal as dream objects. sankara criticized these views. madhyamika talks of shunya as non-dual reality. it does not, however, describe sunyata as an independent absolute entity. it denies the self completely. it does not talk of a substratum. in buddhism, liberation is not in realizing substratum or ground; but letting go of all grounds, i. e. realizing groundless. in advaita vedanta, brahman is the substratum (mahavastu) .on removal of error (avidya) what remains is the eternal brahman. advaita denies the object completely, for “there is nothing else but the self. vedanta accepts scriptural study (upanishads) as a means of gaining wisdom: but that is not mandatory. thus, for the advaitin, reality is ultimately that which is the self-existent, while for the madhyamaka, reality is ultimately empty of such self-existence; while both indeed refer to the ultimate truth as “signless” (animitta). Dear Shastry , Thank you for the mail ; and for digging out an old and a forgotten blog. I wonder how you came upon this !! Yes. I agree Brahma Sutras is a highly important text; and in the Vedanta tradition the Brahma Sutras is without doubt the watermark. But, we have also to recognize that Brahma Sutras are themselves representing the continuing Upanishad tradition. The Sutras attempt to summarize the essential teachings of the older Upanishads in extremely terse capsules. The Brahma Sutras are authoritative interpretations of the Upanishads. Interestingly, Sutras themselves record the diverse opinions aired by previous authorities or teachers on the import of the Upanishads; and then try to resolve the differing views. It is quite likely there were schools of traditions that considered themselves aupanishada the true followers of Upanishads that did not need the Sutras, but preferring to deal with the Upanishads directly. We have therefore keep in mind that in Vedanta tradition the Sutras though highly important is not the basic text, as, let’s say, the Ashtadhyayi of Panini for Grammar. The basic text is the Upanishad itself on which the Sutra is based. That is the view , I reckon , Sri Sankara assumed. Sri Sankara seems to take Brahma sutra more as an exposition of the Upanishads than as an original text. For him, therefore, the Brahma sutras derive their authority from the Upanishads; and, the sutras must therefore conform to the meaning and the spirit of the Upanishads. The Brahma sutras will have to be interpreted in the light of the Upanishads. Sri Ramanuja in turn interprets the Brahma sutra ( as a basic text ) through the Vrtti of Bodhayana and the glosses on the Vrtti by the other purva-acharyas, the old-masters. Sri Sankara, basically , regards himself as the votary of Upanishads (Aupanishada).He even calls his way of thinking or the doctrine as Aupanishadam Darshanam, the Upanishad System. He defines the Upanishads as the texts that lead the aspirants close to the highest reality. He insists Upanishads constitute the final purpose and the import of the Vedic lore; and that is the reason , I assume , he chose to write commentaries on the Upanishads and on the other two texts that depend almost entirely on the Upanishads – Badarayana’s Brahma Sutra and the Bhagavad Gita. It is therefore not surprising that Sri Shankara relied heavily on Upanishad texts to interpret and comment on Brahma Sutra. I trust this puts the issue in perspective. 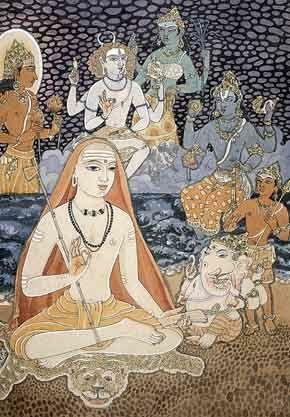 I went through all the 7 articles related to Sri Shankara. Am doubtful, if I can find any other blogs / articles that present the great acharya from such an unbiased perspective !! A humble pranams to you for that ! I just want to share my opinion with you, and please share your views on that.. I agree that over the period many works of great merit have been hoisted on the name of Sri Shankara for gaining popularity or acceptance. And the prasthana traya baashyams are the only work of him without speck of doubts. I just want to know your thoughts regarding Kanakadaara, Nrisimha Karaavalambam and Thotakaashtakam. I guess you will accept Thotakaashtakam to be an authentic stotram composed on acharya by one of his sishyas, during his lifetime. Whereas, Kanakadaara and Nrisimha Karaavalambam were composed by acharya himself during his lifetime events (Kanakadaara during his brahmacharyam and Nrisimha Karavalambam during his entourage across holy places where in Ahobilam he was requested by a kaapaalika to offer his head for bali). I am not aware of the popular Shankaravijayams (like Maadhaviya, Anandagiri etc.). Please share your thoughts on this. Once again humble pranams. May Sri Bhagavan bless you with a prosperous and healthy life. Dear Sreenivasarao sir, any update on my above comment ? I am sorry, I had lost track of the comment. Please pardon me. As regards the Kanakadhara stotra and Sri Lakshmi Nrsimha Karavalamba stotra, they are mentioned in the biography of Sri Sankara – Sri Shankara Digvijayam or The Madhaviya, ascribed to Jagadguru Sri Vidyaranya, the 12th Acharya of the Sriingeri Sharada Peetham. By tradition, these stotra-s are accepted as composed by Sri Sankara. Sorry for my delayed reply. I was not able to connect here, due to my work schedule. Thanks for your references. I had a walk through across them. If we go in a ‘research’ mode, we would get all possible conclusions and confusions. So, I thought it would be better to tread in the path which our purvacharyas have followed and showed to us. This, along with the faith in the feet of Sri Sankara would give us the purusharthas. Thanks once again for your informative articles. Yes Sir. I respect your view.